Just thought I'd let you know that the IoM smoking ban came in today. Hooray! I am not sure about the other Crown Dependencies, but only the IoM has any beery interest anyway with its three breweries, all of which I have been round. I think a quick hop there is overdue. I love the Isle of Man for reasons other than beer, as well as for its beery delights. Ah lost youth! The Isle of Man is an internally self-governing dependency of the British Crown and its people are British citizens. It has three operating breweries, Okells, Bushy's and Old Laxey. Czech Beer Loses It's Taste. Or Does It? Two seemingly contradictory articles caught my eye this morning. In one, the Czech On Line Newspaper the Prague Daily Monitor reports that in an article, leading newspaper Lidove Noviny, is concerned that foreign companies now produce eight out of ten beers consumed in the republic. It states "A number of beer experts and consumers point out that the mergers and acquisitions of Czech breweries by foreign investors considerably damage the unique quality of Czech beer, so the traditional Czech drink is slowly turning into "Eurobeer." The paper further states: "Moreover, the repeated saturation of beer with carbon dioxide to increase its durability significantly harms its original characteristic. Such beer is then often served cooled down to quite a low temperature to disguise its real taste." Now all this might seem a familiar and inevitable outcome of ownership by some of the fizz kings of the world, but it seems that Jan Vesely, chairman of the Czech Beer and Malt Association doesn't agree or rather didn't when he took part in this interview for Radio Praha 3 years ago. He says "The trend is totally opposite. The quality of Czech beer increased incredibly over the last 15 years. There's no comparison with the majority of beers fifteen years ago. Not only shelf life, but also all the hygiene and sanitary conditions. Yes, it's true, that sometime in history every beer from every brewery had a specific sensory profile - or taste and smell, to be more human in my expressions. But I must say this trend of losing this specific sensory value is very positive. Because the reason for the specific taste and smells was different contamination of specific breweries. Breweries were contaminated by bacteria. There were some high-level breweries, but the majority were suffering. And no-one could help themselves because there was no money for substantial improvement. Now, in the new conditions, it's true that beer is more standardised and perhaps one beer is closer to another. But for me it's very positive, because at least now we can be sure that it's just beer yeast that's found in beer as a final product!" Sorry Jan, but when I go to Prague in May, it will be the beers from the small independent producers I'll be seeking for just that "specific sensory profile". If I want beers from the big tastealikes, I can just stay home. Good Brew Dog at Last! Yesterday we had a National Winter Ales Meeting followed by the party for CAMRA staff that had worked at this year's event. The meeting was held in the trendy Font Bar off Oxford Road, an unusual choice, but hey, CAMRA isn't all flock wallpaper and farts! 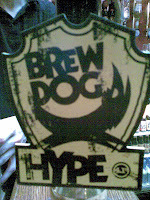 On the bar when we went in was Brew Dog Hype and York Brewery Decade. Graham chose the Decade which was superbly hoppy and bitter. I chose the Brew Dog. Would it be disappointing again? No. It was a rounded beer, with a good malt base, resiny hops and a quenching bitter finish. Lovely. Others thought so too as I only managed two pints before it "went". 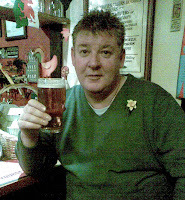 The Decade wasn't a hardship and was in turn drunk dry to be replaced by Facer's DHB, standing for "Dave's Hoppy Beer". It was too. Very. Next up was another Facer's Beer, Landslide which was a lot less hoppy. It drank well though, cut half in half with DHB. I like to experiment. I won't describe the rest of the day in too much detail, which following a successful meeting, degenerated into what can only be called a piss up. We left to meet Eileen and another couple of friends in the Fringe Bar, where pints of Hopstar Daisy May went down very well indeed, while a question about the authenticity of a beer called Phoenix LJ Silver as coming from the renowned Heywood Brewery, must wait until I next speak to the brewer. Suffice to say it was not one of Tony's pump clips, nor was the insipid liquid anything like the Phoenix we know and love. Lastly and unwisely we finished in the Smithfield where we drank some lovely beers between us, with my Durham Definitive and Eileen's Hornbeam Tears of Angels being the pick of a very fine bunch. Just another ordinary Saturday in the Grim North! Tyson rants on about his JDW in Bury being bad. He obviously knows too little about Middleton's Harbord Harbord, which can be guaranteed to plumb the considerable Wetherspoon depths. I gave up on it, more or less, a long time ago, but there is a beer festival on, so maybe, just maybe? The usual scrotes were there when I arrived, but cunningly, I called just at the time when the all day losers were going home and the night time losers hadn't yet arrived. That's the way to beat the system here. You have around an hour, between seven and eight! Glory Be! Seven beers from the festival list were on, so thirds were in order. First up was Bateman's Spring Goddess which had good body and hop with the typical Bateman's house yeast taste. Dry, satisfying and moreish. Then Namyslow Original Plum Beer. This had a nose like Lees Plum Pudding, but there the similarity ended. It was sweet, sweet, sweet, with some Ribena like sweetness. No balancing bitterness. A big yeugh! Next another disappointment. Cain's Bock Beer was smoothly full bodied with no discernible taste or character, other than some caramel in the finish. WTF? I eyed the last three uneasily. Shep's Early Bird, Ringwood 49er - not the publicised new one - and Sharps Eden Ale. The Eden Ale had a strange earthy taste, but good bitterness and malt. Lose the earthiness and it would have been fine, but unexciting. The Shep's was typical. Harsh edged, with a slightly sweet, floral taste to a harsh, flowery finish. At least the beer was improved by decent conditioning and presentation, but it wasn't good. This left the ghastly Ringwood. It had a plasticine nose, vague fruitiness with an odd palate numbing bitterness. A pointless beer in every way. Time was against me, so I finished by having a half each of Lees Brewer's Dark and Theakston's Old Peculier. It would have been Thwaites Mild, but it had just "gone". Both were rather good I thought. So the HH came up with seven. OK most weren't to my liking, but all were in excellent condition. I walked home in plenty of time for my tea and Ashes to Ashes. Now why are there no pubs in this? I decided that this being Day One of the much trumpeted Wetherspoon's "International Real Ale Festival" that I'd do my shopping in nearby Heywood and try a couple of the festival ales on the way home. Well Morrison's did what it says on the tin. They had all the groceries I wanted and plenty that I didn't. I nipped into Lidl for my cornflakes - try them - they are better than Kellogg's by far (what other blog gives you such good food tips?) and then crossed the road to the Edwin Waugh, one of the more pubby JDWs around. It was bedecked in Beer Festival posters and banners. The staff were in beer festival T-Shirts. Alas there was NO festival beer! None! They were selling the usual stuff at festival prices and did have festival beers conditioning. No" they couldn't say what they were, but NO festival beer! Unbelievable! Wind on. I went to Rochdale. The Regal Moon had four on. I wasn't interested in Jennings or Wadworth on this visit, as far more seductive brews were on offer. My eye alighted on two that I, to use a ticking expression, "needed". JDW have commissioned two brews for foreign brewers to brew over here and here they both were, Yo-Ho Tokyo Black and Stone California Double IPA. Two halves were swiftly ordered. OK not swiftly, this is JDW! Now I wouldn't normally do full tasting notes, but this time I will. Both deserve it, as both are magnificent beers! The Tokyo Black is very black indeed with a dense tan head. The nose is liquorice with hints of espresso coffee. The taste is dry, complex and full bodied with roast malt, bitter chocolate and faint balancing dark cake fruits. There is little real hop presence until a silky smooth, subtle, hop edged, coal dust finish with some lingering bitterness. A really good beer and very, very moreish. Now for the Double IPA. This is light, golden-brown in colour with a white, lasting head. Nose is pungent pine resin hops in great abundance. The first sip bowls you over with astonishing palate coating centennial hops and a slight floral edge from the Simco hops also used. The malt backbone needs to be strong to carry this and it is. But this is a hop attack from start to finish and you know it. It is like sticking your head in a hop pocket and tying the ends up. Pine, grapefruit and a wonderful body make you almost swoon with pleasure. The beer drinks beautifully, with little evidence of its strength, through to a long, surprisingly clean, hoppy, bitter, resinous finish. This is a marvellous hop monster with considerable balance and poise. It belies its strength and is a tribute to the brewer. The IBUs (a measure of bitterness) must be off the scale! Of course I had to have two more halves and did. They were even better and to give the Regal Moon its due, all my beer was served at the peak of cask conditioning and at just the right temperature. That's it. Go get some and tell me if you agree! Where Do They Get These Daft Chief's of Police? Another silly spokesman for the increasingly out of touch Association of Chief Police Officers has emerged blinking into the light to tell us we should all be drinking out of plastic glasses. Chris Allison, the Association of Chief Police Officers’ (ACPO) lead on licensing, told thepublican.com he wants polycarbonates to be “seen as the norm”. "Why does everyone hold on to the concept that you have to drink out of glass? What is the difference?” he asked. Bet he doesn't drink cask beer! The perceived problem here is "glassing" a horrendous way of assaulting someone by striking them in the face with a glass. Now no-one, least of all this writer, condones such atrocious behaviour, but it has to be said it is an extremely rare occurrence. Is it really a correct response to say everyone from one end of the country to another should be made to drink out of plastic, rather than using the new powers police have under the Licensing Act, to target potential trouble spots and either close them or order the use of polycarbonate? The trouble with this idiotic approach is that it will penalise the many to help the few. Increasingly this is what we have come to expect from our Police Forces. Why don't they just get off their arses and apply targeted responses to problems, based on risk assessment? Instead of ridiculous broad brush approaches to issues that penalise the innocent, why don't they just do some good old fashioned police work, or is that too much to ask? Good beer tastes bloody awful out of plastic and there are far too many sensible people around to let this happen, so it won't. It has been rightly condemned by CAMRA and by the Brewers and Pubs Association. Maybe not the most sensible people in the world on some subjects, but at least more in touch than ACPO! My thanks to The Publican for reminding me of this issue and giving me the chance for a good old fashioned rant and to Boak and Bailey for the beer glass photo. 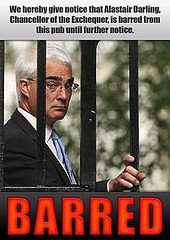 It seems that Mr Darling's recent shenanigans with duty increases have got on the wick of the pub trade more than somewhat. Following hard on the heels of the annual price increases imposed by the brewers before the budget, (nice timing guys) comes Alistair's whopping 4p a pint duty increase, plus a drinks escalator. This will see duty rise 2% above inflation for the next four years. A campaign has started to bar our dear Chancellor from every pub in the land. Copies of a poster can be found here and printed off as required. It is a good bit of fun with a serious message. No-one in their right mind believes that the budget increase had anything to do with binge drinking and everything to do with revenue raising, with its daft attack on pub goers (mainly responsible drinkers in a controlled and licensed environment) in favour of those who buy their booze cheaply elsewhere and then create a public nuisance. But you can't help but feel the trade needs to do better overall and that the main gripe is the Chancellor got in first, thus preventing increases from licensees. Nonetheless Mr D's interference is unwelcome and the poster campaign will at least get the cause of pubs a little more publicity than otherwise, which isn't a bad thing. The trade needs to be much more imaginative in its response to the current anti drink fetish of the press and needs to do much more to attract customers. The pub trade still hasn't got the message that the "offering" has to be much better than it currently is in all but a minority of pubs. The current round of price increases simply puts this fact into a sharper focus. A recent "put down" post on another blog from a professional beer writer to a beer blogger set me thinking. I wonder sometimes if those who make a living from beer writing are predisposed ever so slightly, to frown upon us amateurs and have a less than well developed appreciation that blogging is not the same as a well researched and paid for article. I remarked on the "pro" versus amateur distinction here in February, when a different "pro" got into trouble in a similar way. Two instances such in as many months indicate a tension, a dynamic, an uneasy co-existence or, at least to this blogger, a subject to air! Bloggers usually speak their minds as they choose, pick their own subjects and feel free to give reign to their own thoughts, prejudices and idiosyncrasies. The blog is personal to the blogger - it's what makes blogging what it is and what makes it fun to do. Of course there is serious content and discussion as well as a lot of knowledge, experience and passion. Bloggers get it wrong from time to time too, either in tone, nuance, grammar or fact, but the blog is essentially a pub discussion written down for others to read or ignore, to join in or not. It is not a "paid for piece" and therefore is not subject to professional standards - not that exchanging of money of itself guarantees quality. So why does a professional beer writer blog? Hopefully they just enjoy it, want to belong and will take the rough with the smooth in this knockabout medium which is the blogoshere. On the other hand, is it because it is a form of media they feel comfortable with or one they feel they must be in on? Why does a professional writer give away his words for free? Are they written for a CV or for the potential attraction of commissions? Is it a bus they better not miss or, maybe like the rest of us, they just want to write, paid or not? Do professional writers feel ever so slightly that bloggers are taking their ground, stepping on their toes and using up their potential material? Is blogging a threat to the professional? Professional beer writing in the UK, has a restricted audience in the sense that there are few outlets for it and is often commissioned by a magazine or newspaper that probably has no real understanding of the subject and anyway wants it light and fluffy. Serious beer writing in the national press is an endangered species (if it ever was a species at all) and sadly we in the UK lack a specialist beer press to give other opportunity. Perhaps the blog is just a valid outlet for thoughts that don't or can't attract a commission? If so, why not? Going back to offending, I think we are all guilty of giving out unintentional offence, though amateur that I am, when I offend, I have usually meant to! That may not be an honourable position, if you read Hazlitt, but isn't all writing a personal vanity? In that sense at least, pros and amateurs are as one. “No man lives without jostling and being jostled; in all ways he has to elbow himself through the world, giving and receiving offence.” Thomas Caryle - a Scot of course! * I thank Stonch for this term which seems to fit nicely. Awaking from a major snoring competition to a beautiful Hanseatic day, we decided after breakfast a walk was needed. Where to? the Reeperbahn of course. Now for those that don't know, I mustn't assume knowledge. It is the red light district. Being Old Farts we of course would not be going there in the evening, having neither the inclination nor the need. A very pleasant walk by the Elbe took us there in an hour or so. It was much seedier than I remembered, Twenty years ago it had some decent bars. Now it was end to end strip joints and condomeries. At the top we caught a bus. We needed a drink after the disheartening tacky spectacle. We hopped off the bus at the Hauptbanhof (Main Railway Station). Now big German Railway stations are a wonder. They are miniature cities with lots of cheap and good eats and drinks. I won't contrast with Rip Off Britain. It is chalk and cheese. Several glasses of Jever, Hassroder and Koenig later we jumped on the S Bahn to Schlump. Why there? Graham liked the name and we had a day ticket! By then nature was calling, yet pubs proved elusive in this otherwise busy suburb. At last we spotted a Jever sign and stepped into a neat two roomed boozer with a pretty barmaid, draught Schofferhofer Weisse and Jever Pils. We'd bunker down here for a while. The pub was quiet, the barmaid chatty and we whiled away a very pleasant two hours with her, talking in my broken German, as I was determined to practise and her near perfect English. She made me laugh by telling me she'd never go out with a Bavarian boy because of his yokel accent! But we had other fish to fry. We wanted to try out two brew pubs recommended by Ron. Brauhaus Hanseat and the Groningen Brau Keller were targets. The lovely bar girl was perplexed. She didn't know Ost-West Strasse and it wasn't in her A-Z. Hmm. She deduced correctly as it turned out, that it was now Willy Brandt Strasse, gave us directions and off we went. Easy. Brauhaus Hanseat is a long, narrow, vaulted cellar with gleaming copper brewing vessels and a crap, muddy, sweet pils. We also tried the Weisse which was slightly sweet but with enough banana and clove esters to put it bang in the style. We then went to look for the Groningen Keller. We walked back towards town one street and looking down, saw lights. Bingo. It was the brewpub. We knew because of the gleaming coppers in the window. The staff seemed less pleased to see us and on explaining we'd like a drink,we were led off through a maze of cellars, ending up to our stupefaction back in the Brauhhaus Hanseat!! We made our excuses and left. So it seems two are now one! The rest was just more beer so I'll leave it out. I think it's goodbye to Hamburg from me or should I say "Tschuss". Next in three weeks is Hanover! After dumping our bags in our Altona Hotel, we needed a beer to wash away the travel dust. So out we went, round the corner and saw in the near distance a Holsten sign. Well when in Rome. We entered the little pub to find a fug of smoke. Like old times we thought, but not the good old days. It is simply amazing how smoking in pubs has now gone from our norm. It just felt wrong. Now I had looked this up before I went and Hamburg had banned smoking. All became clear when in rapid German which I scarcely followed, the charming young lady behind the bar signed us up. We were fully fledged members of the smoking club and thus exempt from the "raucherverbot" Jever Pils was the choice here and this bitter beer was a perfect start, though the smoke drove us away after one drink. We left them playing Schock (a dice game) and puffing away happily. We then went to two recommendations of Ron Pattinson's by the main railway station. I'll send Ron a site update. These are round the back and it is a big station. Baumann's Bier Bar has a changed range from Ron's site. We drank Lübzer Pils, a decent if not exciting beer. This too had a lot of smoke as smoking was allowed in half of it. Almost next door is the Paulaner outlet in Hamburg where the full range (except pils) is on offer in a typical Bavarian style bar and a mercifully smoke free environment. Paulaner Hefe Weiss for me and dunkel for Graham hit the spot. Then to the Gansemarkt but we couldn't find the Prinz and Koenig, but did, unfortunately find the Kölsch und Altbierhaus which is a cramped, narrow bar - a dark, strange place which feels underground though it isn't. Sion Koelsch on keg here which was good. We didn't try the Schlosser Alt. Neither are now available on gravity. We did also try and get a drink in the Restaurant Franziskaner, but there was no room at the bar and tables were full of diners. In any event it is clearly more restaurant than pub. One good tip is the Bier Bar in the gallery of the main rail station. Great for people watching, decent enough beer - think Holsten, Astra, Koenig and Duckstein - and a lot more atmosphere than the pubs! 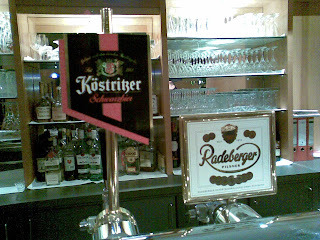 Then back to our hotel for the excellent choice of Kostritzer or Radeburger Pils. I won't bore you with much more of this. Later I'll tell you how we got on in the brewpubs, but Hamburg isn't a great place to drink. Pubs are difficult to find and lack atmosphere and beer choice is distinctly pedestrian. It requires more charm and vibrancy. There are far better German cities to visit, unless of course your requirements are carnal. I'm off to Germany for a couple of nights. Hamburg is the destination and the first German city I ever visited about 20 years ago. I'm looking forward to my return. My mate Graham is my companion for this one, so we'll be drinking in beer as well as sights. Or even instead of. Hamburg isn't a top beer destination, but we'll seek out the good stuff. I'll report back on Friday or maybe before. I haven't really written much about Pictish Brewery of Rochdale, but I will sometime soon. Those in the know are already aware that it produces some of the best craft beer around. On Friday night I had a few pints of Pictish Motueka - no I don't know how to pronounce it either. It was pale, bitter, tropical fruit edged, full bodied and hoppy. Another stunner from the brewer, Richard Sutton. What a great week for beer after a shaky start. And what a one it was. I tried a pint in the Horseshoe Bar on my way to the station. This time the Caley beers were augmented by two guests, Bombardier and Caledonian XPA which for some reason was on offer at a pound a pint. I didn't spot this and had some Deuchars against my better judgement. It was merely OK, but I enjoyed my time in this classic bustling bar for the place rather than the beer. Leaving there a thought struck me. Didn't the Toby Jug round the corner also sell cask? It did. The pub was buzzing as only a Glasgow boozer can and cask was selling well. For my delectation were two "winners" as the scoopers would say. Hebridean Celtic Black was 3.9%. Dry, malty, black as the Earl of Hell's waistcoat, with some balancing hops in the finish. Goodness knows what made it so black, as it had no roast malt profile at all. Still it was a decent beer in the style of a strongish 60/- ale. I had one left to try in the 20 minutes I still had. Tryst Brewery of Falkirk is a new one on me, but watch out for it. The beer was Drover's 80/- and promised to be a classic Scottish Export. Well the brewer got that wrong thankfully. Instead of the sweetish, malt monster expected, my first sniff told me I was in for a treat. A waft of flowery hops rose to meet me.The mid brown beer was clean, with layers of resinous hops interwoven with a subtle flowery leafiness. The malt underlay was excellent, providing a solid tasty body. The dry resinous, hoppy finish was distinct and lasting. This was no Scottish Export, but an American style Pale Ale, verging on the IPA. I eagerly grabbed another half and zoomed off to Central Station disappointed that I'd wasted my time on the Deuchars. So a great finish to my Glasgow samplings. Did the Tryst knock the Kelburn Misty Law off its winning perch? It did. Just! Believe me I can pay it no higher compliment. Glasgow is a great city with some great beer. Scotland is producing some great beer too. Go there! This was the slogan employed years ago to attract people to Glasgow and change its image. Yesterday it applied to my beery wanderings. Under blue skies and a shiny sun I set off with hope. First up was the State Bar in Holland St which most people seem to think has been a traditional island bar with much wood, completely unchanged since God was a boy. I remember it from the 70's, all chrome and mirrors, yet I still read that it is "unchanged". I digress. Today it is a calm oasis with good traditional beer. Two halves were ordered as punters started drifting in for attractive looking lunches. A lot were drinking cask. Signs were good. Houston's Killellan was pale with biscuity malt, a touch sharp maybe, with a clean bitter finish. Fine. Next was a more unusual beer. Williams Bros Kelpie is made with a touch of seaweed. It is jet black with no head despite a sparkler, with a roast malt and iodine nose. Taste is stout like with a mineral salt edge. It was very tart through to a clean dry, bitter, mineral salt finish. A very interesting and complex beer. All in all, a good start. I passed with some reluctance on beers from Salopian and O'Hanlon's. I had to be back sober at Mum's for my tea! I popped in to Hengstler's Circus just across the road. 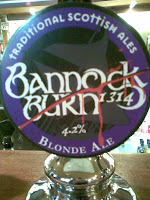 Here, Bridge of Allen's Bannockburn 1314 was on form, cool full bodied, with sweet malt and a slight bitter finish. A few more hops wouldn't have gone amiss, but good all the same. 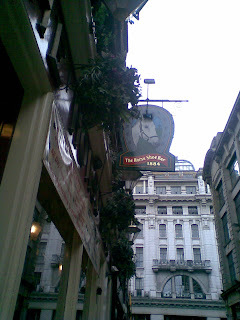 Then to my first ever real ale pub, the Bon Accord. It was there in 1974 I first tasted cask conditioned ale. McLay's 70/- if I recall correctly. Today it is still a Glasgow Real Ale mecca. I was spoilt for choice. Two halves again. This time Kelburn Misty Law and Brew Dog Peroxide Punk. The Misty Law was an outstanding 4% beer. Pale, with a distinct American hop nose, good malt backbone, with bitterness throughout to a resinous, lasting, hop finish. Great! It was with some trepidation I turned to the Brew Dog. I wanted to like this. As Alastair Darling hammered nails into the beer on-trade coffin in the background, I picked up my glass. A slight toffee aroma was followed by a immediate bitterness. the malt was fairly thin. The beer was rather like a stewed hop tea with some underlying sweetness and a bitter, slightly sticky finish. It wasn't a bad beer by any means, but coming as it did after the outstanding Kelburn, it came a bad second. Maybe next time? Then a half of Fisherman's Pride from the Windy Goat Brewery. This five percenter is chestnut brown, caramel nose. A bitter, roasty, dark cake fruits interior surprises and delights. It drinks with a full body and a lasting bitter finish. Excellent. I also had a quick half of Clarks Westgate Gold which had papery malt, some astringency and a bitter finish. I did not try any others as I simply had to have a full pint of the Misty Law. What a good beer. Thus satisfied I headed back to the station, breaking my journey at Partick for the walk along Dumbarton Road to the Three Judges. I have to say the choice here was poor, but a half of Strathven Clydesdale IPA was refreshing, though it is an ordinary bitter and by no stretch of imagination an IPA. I had a half of something else which I forget, but which couldn't have impressed. 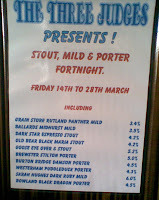 I was disappointed, but in fairness the barman advised they were clearing the decks for a forthcoming Mild, Stout and Porter Festival. Fair enough then! So Glasgow delivered. The pick of the beers for me is obvious. Step forward Killellan. The State Bar is just wonderful though, cosy and inviting with a pride in its beer. Don't miss it! Glasgow Doesn't Belong to Me! I am at my mother's at the moment. I arrived to a wet and blustery Glasgow Central station and after nearly four hours on the train, I needed the liquid refreshment that only beer can provide. So straight across the road to the legendary Horseshoe Bar. This place was buzzing, but I was unable to stop and savour the "patter", as the beer choice cask wise was limited to Caley 80 Bob or the ubiquitous Deuchars IPA. Damn. These just wouldn't do. So girding my loins I set off to Queen St station where I'd catch my train to Dumbarton. On the corner of George Square is the Counting House, a magnificent and huge conversion by JDW of an enormous domed former Bank of Scotland HQ. It is grand in every way and usually offers a great selection. Not this time really. I chose unwisely for a start. My first choice, Schiehallion, sputtered and died. It had gone! My second choice was Brains Bread of Heaven. A malt monster with an unpleasant harsh finish. Hmm. A half of the even more malty Cairngorm Wildcat was cloying. Deuchar's was avoided, but I'd saved the best 'til last. Phoenix Navvy would surely do the trick. It didn't. It was served southern style and the beer was ruined by it, with the balance being adversely affected. I reckopn too it was past its best. Damn again. So what to do? I know I thought. I'll go to the Station Bar. This GBG pub is near where Buchanan St station used to be. It is a bit of a hoof, but I thought "it'll be worth it". It wasn't. In a busy pub I could see I was the only one drinking cask. Four beers here. Abbot? No. Theakstons Best? No. So halves of Downton Forest King and God help me, Deuchars IPA were procured. Both were vinegary and undrinkable. It was obvious no-one had pulled the warm beers through since they were last purchased, I left them and went home to welcome cups of tea. This simply isn't good enough in a GBG pub. I'll be writing to Glasgow and West of Scotland Branch of CAMRA to tell them so! JD Wetherspoon founder Tim Martin has written to the Competition Commission objecting to Heineken’s takeover of Scottish & Newcastle. Martin argues that the move will see a serious reduction in competition and that he is worried by Heineken’s “attitude to price”. He complains that Heineken has refused to supply Amstel to his company because Wetherspoon wanted to sell it for £1.99 a pint. Martin says in his submission to the Competition Commission: “The number of brewers from whom publicans buy recognised and attractive lager products has dropped dramatically in recent years as the number of major brewers has contracted through takeovers. Martin claims that a main motive for the Heineken takeover of S&N is to reduce the level of competition in the market and to push up prices to the licensed trade and, ultimately, to consumers. Well what about that then? Timbo is undoubtedly right, but is he the right guy to say it? This is the second of my more or less monthly attempt to summarise and comment on what other beer bloggers are up to. Let's start with a newcomer. Tyson is based in Bury, Lancs and comments mainly on the drinking scene around there and in Manchester. He starts off in good form by giving his local JDW a good kicking and in forthcoming blogs he savages a few places and quite a few beers, while heaping the odd nugget of praise on a select number. He has a neat ploy of giving his friends amusing fictitious names to protect their anonymity. "Joe Stalin" particularly appeals to me and the "Manx Minx" sounds like just my sort of lass. This is a beer blog dedicated to beer drinking and lots of it. He must cover more beers than any other blogger and they are all supped in the pub. If you want to know what's drinking well on the free house scene, this is the blog for you. Beer from the Motherland is written by Kieran Haslett-Moore, a blogger from New Zealand who keeps one eye on the British ale scene through various imported bottles. He is also a fervent home brewer and, it seems, a good one at that. He brews cask ale and his posts tend to be dominated by his brewing exploits, but are enjoyable and interesting. Away from home brewing, his post on "Regional Rivalry" drew a fair number of forthright comments. It is good to hear from a different part of the world and now, at least, I'll know who to ask about the best places to drink in NZ should the need ever arise - and I hope that it will. I said in the first of these summaries that Boak and Bailey's site was growing on me. It continues to do so. I liked their beer photography item a lot. They sure have an eye for a beer photo. Other items of merit were an examination of glassware in relation to beer which is a subject dear to my heart and one on waiter service which brings back fond memories for me. I must also mention the article on organic beer which concluded there is nothing special about it at all in terms of superior taste. Agreed! The Southport Drinker churns out a lot of stuff. He is concerned mainly about the state of Southport's pubs, but ventures far and wide in terms of subject matter, with particular emphasis on government policy on alcohol. His comments on other blogs as well as his own indicate some conspiracy theory tendencies. He was recently taken to task by Stonch on this. To me conflating several issues together in this way is always problematical. It is probably best to deal with each issue individually, though he is not alone in thinking there is a bigger hidden anti drinking agenda. It does seem to me that while the health lobby bangs away about alcohol, the main concern rightly is about teenage drinking and its link to bad behaviour. The Southport Drinker seems to indicate conviction that this Government will just meddle ineffectually and he's probably right. Over in the Netherlands Ron Pattinson continues to write at length about beer styles from the past. These can be a bit wordy and hard going for the less than committed and Ron is the first to say so himself. There was one cricket ball in the bath though, when he challenged the BJCP (An American based home brewing outfit) on their style definitions. It certainly provoked a fair bit of comment and some self justification from the BJCP. He also mentions his forthcoming Bier Mania trip. I fancy going on one of these sometime, but reading Ron's posts about his last one, I'm not so sure I'm up to it. They seem a bit hectic! A few others. Beer Buzzing seems to have run out of steam a bit at the moment, while Maieb brought up the subject of the world's most expensive beer and is still desperately seeking Cherwell Valley beers, which somehow seem to elude him. I wish him luck at the Leicester Beer Festival where said beers are meant to be appearing. Slightly further afield, an old mate of mine, US beer writer Lew Bryson writes an eclectic beer blog from his professional point of view. Lew is kind of or should I say kinda folksy when he writes, but he does write well. His piece on Orval was good, particularly as his Orval epiphany was in the Waterhuis in Ghent. Good choice of venue. I remember drinking them dry of it with a couple of others, including a Yank mutual friend, a few years ago. I agree too it is still a good beer! Incidentally another mutual friend took the main photo on Lew's Blog. It's a small world the beer world in some ways. Stonch has been in Italy and has disappointed his fans by not keeping in touch as much as they'd like. Give the man a break. He's on holiday! Before he went he stirred up things with two posts criticising the "standard" CAMRA style pub when discussing the CAMRA Pub of the Year winner and one in Market Rasen which Stonch hinted was designed only to attract "Real Ale Twats". It was good knockabout stuff, but somewhat inconclusive. Stonch also mentioned a "third way" for real ale pubs which he has yet to define meaningfully, but is likely to provoke debate when he does. Lastly the Beer Nut understandably from his Irish base tends to drink his beers at home, or possibly only to talk about the beers he drinks at home. Given that Ireland must be, with few exceptions, one of the worst places for beer choice in Europe, this is forgiveable. Nonetheless he manages to find a large range of different bottles to try, which I'd have thought was a feat in itself. His post on Guinness Red was very enjoyable indeed. All the more so for being at one with my thoughts on the subject! That's the round up for this month folks! For Frane. I've hyperlinked all as requested! I worked yesterday again at my local pub. There were three, maybe four significant events. The first of these, the reason I was working, was that the North Cheshire Hunt was paying one of its annual visits to the area. The pub would therefore be exceedingly busy so it was all hands to the pumps. Before any fox lovers rush to the barricades, this is strictly a drag hunt, the trail having been marked beforehand in aniseed. Now I have to say the hunters were model customers. They were to a man and woman polite and cheerful despite the awful weather. 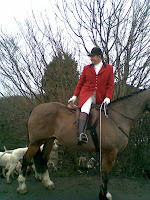 After serving them some bracing pre-hunt snifters, we put on a stirrup cup of mulled wine and saw them off. Later they returned in force, muddy and wet and some, damaged. 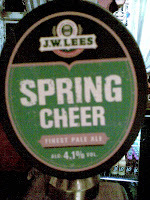 The significant event beer wise was the pouring of the first cask of Spring Cheer, Lees new seasonal beer. The blurb promises wheat malt with hints of cinnamon and cloves. Hmm. I'm not sure about either in a beer that isn't dark, strong and Chrismassey. I needn't have worried though. The pale, golden, 4.1% beer was spicy from the wheat, full bodied, with just a hint of cinnamon buried in the smooth, bitter and hoppy finish. Thankfully I couldn't detect any cloves! It is a good beer. I hope to drink a few more of it today as yesterday I just had a half pint. Oh and the other significant event? Scotland beat England at rugby. I won't bother with the fourth, preferring to leave United fans to their private grief. I read continually about various "brands", all look alike and taste alike lagers, setting out to differentiate themselves in an increasingly crowded market. Some are obvious such as Alhambra the Spanish fizz producer aiming at tapas bars and Spanish restaurants or Tsing Tao, aiming at Chinese ones. There are loads of them coming out of the woodwork as importers take advantage of the disarray in which the lager "on trade" currently finds itself. They all have perceived niches to aim at. But they are all, by and large, tasteless industrial fluids, carried expensively over miles of ocean. Want to feel my big carbon footprint Lagerboy? 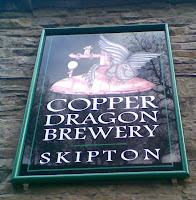 It is therefore heartening, pleasing, and just bloody good news to see that one of my favourite breweries, Copper Dragon, the Skipton-based cask ale producer, is to double its brewing capacity by moving to a larger site in the town. Copper Dragon produce superb beers such as Golden Pippin and Black Gold. They are modern, clean, hoppy and flavoursome beers. If you haven't had their beers you are truly missing out. The new 120 barrel plant will be built by an unnamed German Brewery, will cost £2.5 million and will double capacity. It will stay in Skipton to draw on the same water it currently uses. At the same time the brewery is looking to increase its current estate from 10 to 30 pubs. Copper Dragon has had a 500% growth rate in four years. Who says there is no future in cask? I had a bottle of this last night and was very impressed. I won't bore you with tasting notes, as I was drinking it not de-constructing it. It was bitter, hoppy, clean and a damn good drink. It was also as English as you could get a bottle of beer to be and none the worse for that. Fancy a Pint at the Rovers? While I am in less than serious mood, I came across the story that ITV, the makers of Coronation Street, might franchise the show's pub as a High Street chain. ITV managing director Dawn Airey said: "We are absolutely looking to exploit all our brands in a far more commercial and efficient way. "A huge amount of value lies in big ITV brands like Coronation Street and finding more creative and imaginative ways of exploiting those brands." I think the idea is laughable, but at least the Rover's sells cask I suppose. Any other views? For foreign readers, Coronation Street is a long running and popular soap opera. Scott Waddington from the Independent Family Brewers of Britain said: “It seems that the nation likes a landlord who can make them laugh! And they’ve chosen wisely. A good landlord should have a great sense of humour, be sociable and fun and know how to make their pub the hub of the community." It is a good bit of fun. So who'd be your fantasy landlord or landlady? 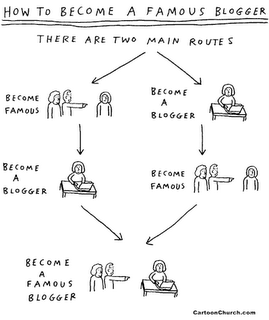 So it's a kind of success, sort of, we think. Thus spake the Government having reviewed the Licensing Act 2003 which became operational on 24th November 2005. The key outcomes are that crime and alcohol consumption are down overall, but some areas have seen a rise in disorder and drink-related violence in the early hours. The press driven myth of 24 hour opening is exposed as lies as anyone with any sense already knew. Most 24 hour licenses have gone to hotels (for residents only), with the next biggest group being supermarkets. A very small number has gone to pubs and most of these never use the extended hours anyway. 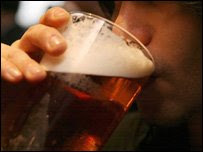 The average length of time a pub stays open later than it used to is a conservative 21 minutes! I am glad that there will be little meddling in the new act or its operation. The Government is quite right in saying it gives powers to Local Government to curb the worst excesses of licensed premises, if only they would use them. I have no time at all for the disingenuous mouthpiece that represents the Local Government Association (Sir Simon Milton). It is his Local Authorities that allow the late opening, that set the licensing objectives, that allow ghettos of "youth bars", all next door to each other and that fail to use the powers allocated to them under the Act. (They had already allowed these places to open to 2 or 3 in the morning under the previous Act.) 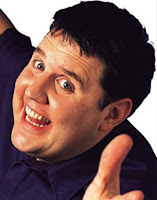 If the new Act hasn't curbed binge drinking, how much blame can we attach to Simon and his pals? Those of us who drink in pubs have enjoyed a modest relaxation of licensing hours. For us it has been successful. It isn't the local pub that is causing problems in town and city centres. Most of the problems come from loud bars selling cheap booze to irresponsible young drunks at a time when almost every pub has long since closed for the night. As Tim Martin, Chairman of Wetherspoons said: "People need to be re-educated about their drinking habits..... you have to persuade people it's a bad idea to get paralytic." Exactly! I am always banging on about how pubs need to make an effort to attract customers. This is a rule that should always be followed, but it is brought into sharp perspective when the pub is, as my local is, a mile up a rutted lane from the nearest bus stop. There is no passing trade. Trade has to be attracted. The landlady of my local is nothing if not imaginative and enthusiastic. 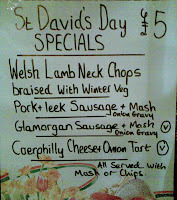 To entice customers on a quiet, wet Saturday night, we celebrated St David's day. 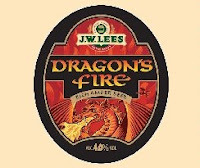 This had been well trailed in advance, with a special menu promised and the launching of Lees' new seasonal beer, "Dragon's Fire". When we arrived at around seven, the pub was busy and thoroughly bedecked in Welsh things. There were giant inflatable daffodils in an equally giant vase, courtesy of Dave the landlord's visit to the Millennium Stadium the week before. Welsh flags and bunting and various other Welsh paraphernalia were everywhere. It was a little piece of Wales in Lancashire. Everyone bought little daffodils to wear in their lapel, thus enhancing Marie Curie's coffers and the place was buzzing. I had home made Glamorgan sausages, E had home made cheese tart with Caerphilly cheese and the Dragon's Fire flowed like the River Taf in spate. It was a great night out. We tottered off for the bus around eleven, full of beer and bonhomie. The pub was still going like a fair! Pubs can't just expect customers to make all the effort. When the pub sets out to do something different, the rewards are there for all to see. Everyone had a great time and hopefully the pub made a few bob. Lees Dragon's Fire is a slightly darker, more bitter version of Lees Bitter. It is a very good beer, but really I expect seasonals to be significantly different from the main beer. This isn't. I know pub crawls can be boring to read, but I like to go out and drink beer, so this time, this is what I'm going to tell you about! On Wednesday I decided that the new X46 bus service, which stops at my nearest bus stop and passes one of our more far flung current GBG pubs, had to be tried out. I gave my fellow blogger Tyson the Beer Hound a ring and arranged to meet him at the Albion. Alas while the X46 did its part of the deal to perfection, I arrived to find a dejected Tyson standing outside a firmly closed pub. His tail was not wagging. Perhaps I should have checked the guide first I hear you say ? I can only agree. Fortunately a bus was coming the other way and we hopped on it. We alighted at Sam Smith's Alpine Gasthof - I kid you not - a little piece of mock Bavaria in deepest Rochdale. Just look at the picture and you'll see what I mean! However we ignored the Alpine temptress and crossed the road to the Mark Twain. This is an ex Lees house, now free of tie, pleasant enough, but with an unfortunate layout. A tiny bar presents you with a wall of local's backs and horror of horrors, a pool table to the left as you go in. We settled down on leather sofas with very acceptable pints of Phoenix Navvy to plan our drinking attack. So acceptable, we had two in fact. Then to the home of the former McGuinness Brewery, the Cask and Feather. More Navvy available here, but we opted for Hornbeam Best Bitter which was not at all bad. A half of Moorhouses, Blond Witch was cloying and unpleasant, but then again, I've never liked this beer. It is a blend and it shows! Next the Flying Horse. Despite the off-putting signs on the door listing the many things you can't do, the beer range was good. Lees Bitter, Taylor Best and Landlord, Moorhouse's Premier and Spotland Gold from Phoenix. This golden, hoppy beer was chosen. It is uncompromisingly bitter, full bodied and very drinkable. We drank two and cutting a long story short, came back for two more later! In between we visited the Baum, an unusual wine bar like pub with sits in the conservation area, well single street that is Toad Lane. Three beers here. Two were from Owl of Oldham which sent alarm bells clanging. This brewery is very hit and miss, mostly I am sad to say miss. Night Owl was dark and acceptable, though not brilliant in any way, while Pacific Gem was astringent and unpleasant. My notes say we drank Monkey Biz, but I'm damned if I can remember anything about it! Not even who brews it. You can always rely on the Baum to have unusual beers on and the pump clip display has some excellent choices. It varies its range, so you take pot luck. I'd recommend it despite us hitting a choice we didn't care for. We also popped into the Reed. (Pictured in its Banks Livery). This ex Bass House, now Marston's is a lovely little pub, down a ginnel, just off the main shopping street. It should thrive but clearly doesn't. It is up for lease yet again, a series of hopeless cases having driven it into the ground. We noted the turned round Jennings pumpclips and the sole offering, the ghastly Marston's Bitter. On enquiring about the Jennings, we were offered the unlikely explanation that he sells so much Marstons that the brewery won't supply him with Jennings! Eh? We made our excuses and left. Then a bit of campaigning. The half timbered Spread Eagle (pictured at the top of this post) is again a lovely pub, bang in the centre, with unlimited potential. I used to go for a pint there 20 years ago. Now it is a sad parody of a pub, run down and unappealing. We went in and asked for cask. We knew they hadn't got any but wanted to make the point. Why no cask when it is successful elsewhere in Rochdale? Shrugs of shoulders! We then headed to the almost adjacent White Lion, right at the top of Yorkshire Street. A nice, neat, tied Thwaites House this. Same thing. No cask and the same vacant shrugs. Come on Thwaites. Get someone in there who cares and give us proper beer! Our final port of call was the Flying Horse (again) where soothing pints of Spotland Gold calmed us down for our journeys home. So as expected, we got good and bad. The GBG pubs stood up well as you'd hope, with the exception of the Regal Moon which I haven't mentioned as we found nothing worth drinking in there. The Mark Twain needs to spend some money on altering the layout I'd say and a couple of potentially very good pubs need to wake and smell the cask. Next time you are in a pub with keg beer or a crap range, complain. It might just help change things as complacency, incompetence and a complete lack of imagination, regretfully abound in the licensed trade. I have deliberately pictured the failing pubs, just to show that they are fine looking boozers with potential.